For those who are unfamiliar with the name Trippie Redd, let me give you a little introduction. He’s a Canton, Ohio hip hop artist that has been making music for about 4 years now. He started blowing up in 2016, with his biggest year yet being 2017. He has ties to artists such as XXXTENTACION, 6ix9ine, Travis Scott, and many more. Redd is known for his nasty flows, but also his light singing voice. He’s an artist that brings a lot of variety on each project. He has released 2 mixtapes before this album, which are called A Love Letter To You and A Love Letter To You 2. These mixtapes were received well by the hip hop community, but left them with some questions about Trippie. Some of these questions include: is he a one-hit wonder, can he create a serious project, and does he have longevity in the music industry? Let’s dig in and see if Trippie Redd can answer any of these questions for us on his debut album. The Good: One thing that I noticed during my first listen through this project is that Trippie really showed off his full artistic range. Each song sounds different and brings a different vibe to the project, which is what makes it shine. The Bad: The only thing that I see as a negative right now is that some of the songs are really short, sometimes painfully so. There are tracks that are absolutely terrific but are only 2 minutes. I hope in the future Trippie fleshes out his tracks a bit more than he did on this album. The Good: As I said before, each track is wildly different than the previous or next one. With a difference in sound, there is usually a difference in lyrical content. That is certainly true for this album. Whether it’s a straight rap track about his street hussle or a lighter track about his feelings, Redd explores different topics very well. In addition to the lyrical content on this album, he also brings out a few different flows that keep it interesting. He has his braggadocious flow on some of the tracks, and uses his beautiful singing voice on others. It’s really a good mix and I think it contributes to the album as a whole. The Bad: Even though each track does sound different and contain different lyrics than each other, that doesn’t mean that everything we hear on this project is different from his older music. I’ve already heard about how many chains and women you have Trippie, I’d like to hear more about your childhood and experiences instead. The Good: If you’ve never listened to Trippie Redd before, he’s an artist that is really ambitious in terms of the beats that he raps/sings over. He chooses anything between a hard trap beat or a soft and soulful R&B-type beat and somehow pulls them off. The same is true for this project, as we see him fit well over every beat while also sprinkling in a little something new. The Bad: Honestly, I don’t have anything bad to say about the beats on this album. Trippie fits quite well over them and clearly knows what he is doing with his beat selection. I hope he can keep this up throughout his career, because he’s already on the right path at 19 years old. The Good: As I’ve previously stated, this album has a lot of different sounds on it. This definitely helps the replayability. I’d rather listen to an album like this that has many different sounds than something that sounds too similar throughout. If this is your first Trippie Redd project, I think it is a worthy introduction to him that can be listened through multiple times without too much effort. It definitely doesn’t drag on, especially with the short tracks. The Bad: The only bad thing I can really say about the replayability of this project is that there is a severe lack of features and it can get a bit tiring listening to Trippie Redd exclusively- save a few features here and there- for a whole 46 minutes. This is especially true if you are skeptical on if you even like him in the first place. A few more features would have probably done him a bit of good for this section of the review. Honestly, all of the songs on this album deserve to be listened to and I think that Trippie picked the perfect amount. But telling you to listen to all of the tracks on the album isn’t the point of this section of the review. The tracks that stand out to me the most are “Taking A Walk”, “Missing My Idols”, “Oomps Revenge”, and “How You Feel”. I’ll be honest; when I first started listening to Trippie Redd, I wasn’t sure if he had it in him to create a project like this one. I saw him as just another Soundcloud rapper that was all about the money and didn’t care about the artistic aspect of music. But I can admit when I was wrong, and I was wrong about Trippie. 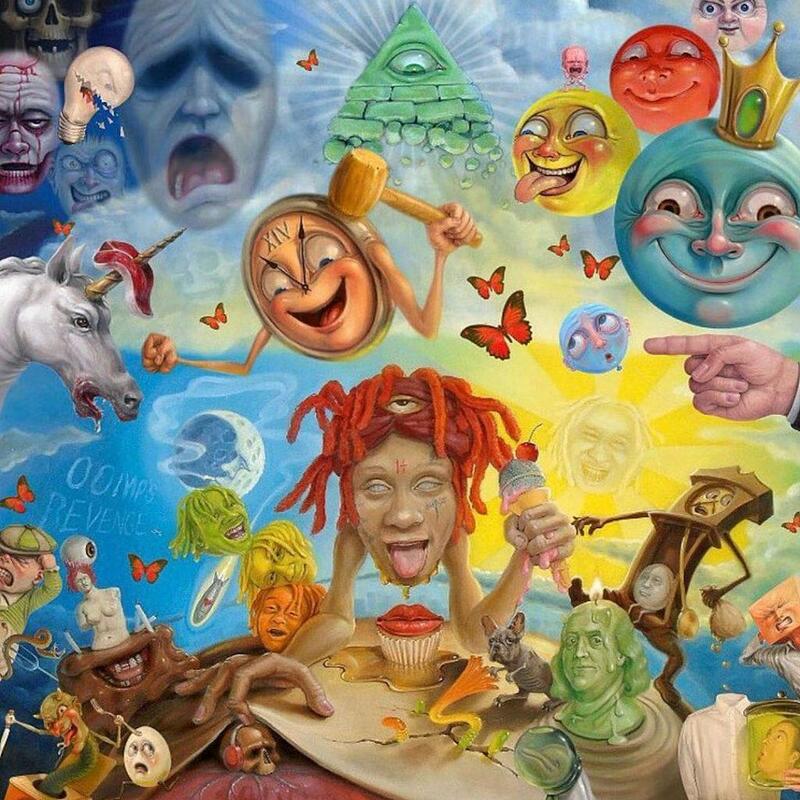 After listening to the album all the way through 3 times, I can say that I’m thoroughly impressed with what Trippie gave us. It contains depth for those who like more personal music and bangers for those who listen to Trippie while partying. The album is so full of variety, and I think that’s what impressed me the most. I believe that this album is exactly what any artist should go for on their debut album. They should try to show everything they can bring to the table, but still leave some room for more artistic growth in the future. Trippie did just that with this project and it deserves praise. While this album probably won’t do huge first week numbers compared to his Soundcloud brethren, it ranks among the best projects released from that generation for sure. This album deserves the attention of hip hop fans everywhere. It may not be for everyone, but it is absolutely a quality album that I think will age well. Trippie Redd delivered a solid debut album that was exactly what I was looking for, save a few minor things. Here’s to Trippie seeing much more success in the future and continuing to drop quality projects.